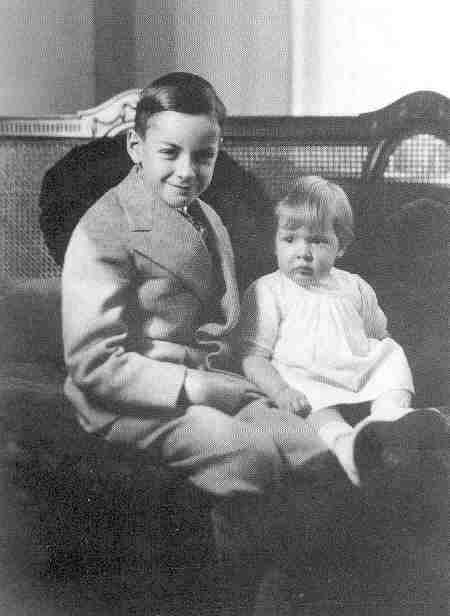 Joan Feynman was born in Queens, New York City in 1927 to Lucille and Melville Feynman, nine years after Richard came along. Both children were raised to be insatiably curious. Their parents encouraged them to always ask why, and to take notice of the world around them. Joan deeply admired her brother and was always interested in whatever he was doing. Richard capitalized on this right away, making Joan his first student. He taught her how to add simple numbers together when she was three. Whenever Joan got one right, Richard let her pull his hair and would make funny faces. Anything Richard learned about math or science, he would repeat all over the house, which had the dual effect of reinforcing his understanding and piquing Joan’s interest. Their working relationship continued, too. When Joan was five, Richard hired her assist him in his bedroom electronics lab. For a few cents a week she would flip switches at the appropriate time. Sometimes she had to put her finger in a spark gap to amuse his friends. One night when Joan was quite young, Richard pulled her out of bed and led her down the street to a nearby golf course. He told her to look up into the sky, which was ablaze in the brilliant colors of aurora borealis. Joan was mesmerized. In that moment, her destiny became clear to her. At the time, no one knew what caused auroras. Joan became determined to unlock their mysteries. Her mother had other ideas, though. When Joan proclaimed to her at age eight that she wanted to be a scientist, her mother told her that “women can’t do science because their brains aren’t able to understand enough of it.” Joan was crushed. From that day on, she doubted her abilities. Lucille Feynman wasn’t trying to be cold-hearted or unprogressive. She had marched for women’s suffrage in her teens. Still, she believed that women weren’t as intellectually capable as men. This was then. For a while, Joan’s aspirations were put on hold. There weren’t many women scientists to look up to in the 1930s, anyway, except for Marie Curie. She was iconic, perhaps too much so. 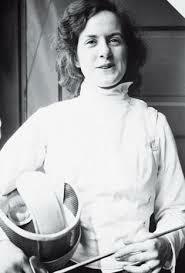 Joan saw her as mythological, a majestic unicorn of scientific greatness, not a human woman she could try to emulate. Even so, Joan wasn’t discouraged enough to lose interest in science. For one thing, Richard had never stopped rooting for her. When she turned fourteen, he gave her a college-level astronomy textbook. She found the material difficult but took his advice to start over from the beginning when she got stuck. On page 407, Joan found something that would give her the one thing she needed the most to seal her future—validation. On the page was a graph of spectral absorption lines credited to one Cecilia Payne. Joan was ecstatic. A woman scientist! Finally, concrete proof that her mother was wrong. Not only can women understand science, they can have their work referenced in a textbook. Joan’s confidence was renewed. Of course, becoming a scientist wasn’t that simple. Joan faced adversity everywhere. During her undergraduate studies at Oberlin, she did all the lab experiments while her ill-prepared lab partner got all the credit. A professor at Syracuse University told Joan she should write her dissertation on cobwebs, because she would encounter them regularly as a housewife. After finishing her PhD in 1958, Joan tried to find a research scientist position by posting in New York Times classifieds. The listings were split by gender, and they told her she wasn’t allowed to post among the men. But who would look for an astrophysicist in the women’s section? By the early 1960s, Joan was working for a small company that made solid-state devices. She was also raising two young sons with her husband Rich Hirshberg, a fellow scientist she met at Oberlin. When the commute became too much, she quit to try full-time domesticity. For three years, Joan did nothing but cook, care for the boys, and clean the family’s five-bedroom house. The only semblance of science in her life involved baked goods. Joan was miserable. On the advice of a psychiatrist, she went to Lamont Observatory at Columbia University to look for a job, but worried that she’d been away too long. Immediately, she had three offers. 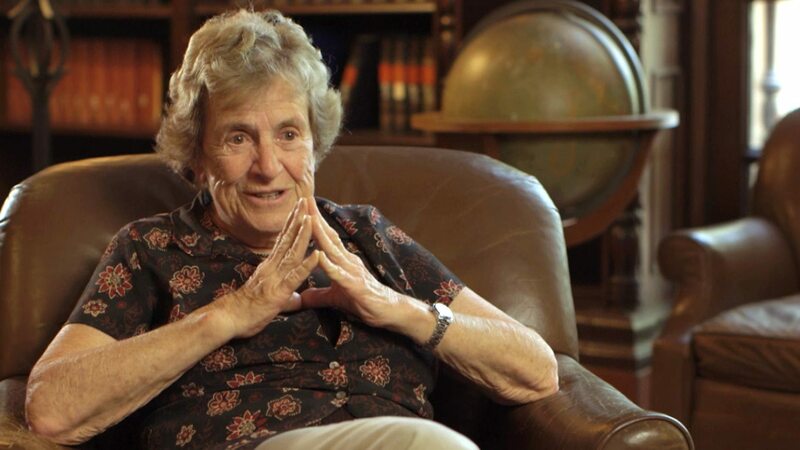 At Lamont, Joan studied interactions between the magnetosphere and the solar wind. In those days, astrophysicists believed the magnetosphere was closed and tapered like a teardrop. Joan discovered that it’s actually open-ended, and has a long tail on the side opposite the Sun where the solar wind don’t blow. In an open model, the Sun’s magnetic field more directly influences the magnetosphere. Several years later at NASA’s Jet Propulsion Laboratory (JPL), Joan was able to demonstrate that aurora happen when solar particles penetrate the magnetosphere. As these particles mix with those in the magnetosphere, the collisions manifest as brilliant colors. She also studied sunspot cycles and coronal mass ejections (CME). These are solar storms that can greatly affect the magnetosphere and are capable of disabling satellites and interrupting terrestrial communications. At the time, CMEs were difficult to pinpoint. Joan’s research showed that wherever there are CMEs, there is also a significant increase of helium in the solar wind. Joan also proved that CMEs occur in groups. From this research, she devised a statistical calculation to predict the number of high-energy particles that could bounce off the average spaceship during its lifetime. This important development resulted in better designs with greater longevity. In 1999, NASA honored her with an Exceptional Scientific Achievement Award. Joan retired from JPL in 2002. Since then, she has turned her focus to the effect of solar cycle variations on climate change and historical climate anomalies. At the age of 90, she’s still fascinated by all the crazy things the Sun does and is still determined to find explanations. I don’t recall Richard ever mentioning her in his books. I believe I read this from “Surely You’re Joking”. There was also the anecdote about the group that called him sexist, and protested outside one of his talks. I don’t recall exactly but he implied that his being there with his sister who was also a physics PhD diffused the situation in some way. Richard and Joan encountered the group of protesters on arrival and they were handed pamphlets entitled “FEYNMAN SEXIST PIG!” Joan thought they were great, and asked for more. Inside, two of the session’s organizers saw Richard with a grinning woman holding an armload of pamphlets, and mistook her for a protester. Nope, she just thought the whole thing, especially the embarrassment suffered by her older brother, was a hoot. Siblings, eh? No, diffused, the situation was made more spread out. There was no fuse because no one could actually do anything. I googled this, because I thought it was interesting, and it appears the internet says you defuse a situation, not diffuse one. You can defuse a crowd by calming it down or diffuse it by hosing it down with a water cannon. He mentions her at least once that I recall in “Surely You’re Joking, Mr. Feynman!” in the chapter, The 7 Percent Solution. I remember it very well because I use the advice she gave him all the time. Oh! This is so important. Trying to understand things from “first principles”. :) Recently, I read somewhere that this is what Elon Musk swears by too. I quite agree. Many sillycom valley Jr bosses w college devrees had to be trained by certain if we lessors, who just knew the basics, exceedingly well. Would you like to try that comment again? OK, that was an awesome read. Yeah, these are the articles I really enjoy from Hackaday. I hope this one makes into into the omnibus. Very interesting, I would postulate that the likeness of the bicarbonates in the powder and soda, set up a sympathetic resonance in duplication, causing more chips to appear…. though due to the bicarbonates maybe not being identical, one being ammonium one being sodium, then it’s likely that half the chips are in fact carob rather than chocolate. This is of course a natural consequence of the observer being indecisive and firmly choosing either baking powder or baking soda, allowing the timelines to split cleanly, thus it followed that the wave functions of each interfered with each other, causing similar timelines such as those containing carob or chocolate chips to be drawn together in the ensuing paradox vortex while the multiverse attempted to get itself sorted out and restore the seams on the trousers of time. I’m always happy to read about and celebrate interesting people. Thanks! If you run shy of baking powder, mixing baking soda and cornstartch creates it. My mom was my Richard Feyman. ARRL Handbook at 8. I had to reread parts as Joan did. But who knew that there were adult books and kids books?!? How? 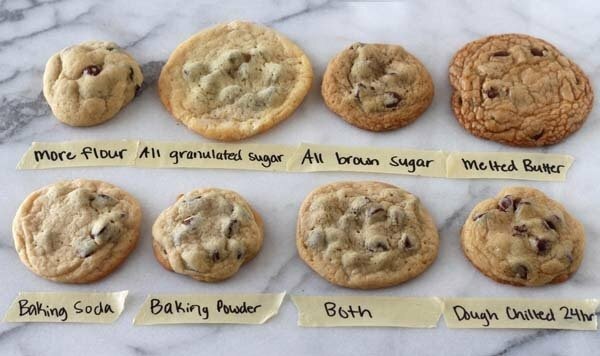 Baking powder is a double acting thing that releases CO2 when mixed with water, and then again when heated above 50 C, whereas baking soda only does the latter and the corn starch has no effect on producing the CO2 that makes the cookies rise. Good question! Read it. Tried it. Worked for me. Did not do a side-by-side comparison, although the subject was chocolate chip cookies, which I once baked 8 dozen to sell 4 to pay for the ingredients. They sold fast. If it’s any clue, I make mine soft, which means more flour & less sugars… but they must rise more than crispier less flour / more sugars versions. I simply remember the hack. It does lack preservatives/stabilizers so don’t make 4 months’ worth. Apparently you can always substitute baking powder with baking soda in a 2:1 ratio which is why the receipe calls for cutting the soda with flour. The point of the acid (citric acid or sodium pyrophosphate) in baking powder is partly to neutralize the taste of lye resulting from when sodium bicarb turns into sodium carbonate in the oven, so basically you can achieve the same result by adding a dash of lemon or orange juice. Wrong. You can’t always substitute baking powder with soda, and the acid is not there only for the taste. * Add soda to water. Nothing happens. * Add baking powder to water. Watch it bubble vigorously. Acid is key for the reaction to take place. Wikipedia pages on “Sodium bicarbonate” and “Baking powder” are actually a pretty good resource on this. I thought baking soda was just an acid and base in powder form, so water causes it to dissolve and then react. Corn starch is neutral and absorbs water like crazy. Baking soda is just soda. Baking powder includes bicarb and acid mixed dry, so they don’t react until water is added. I’m pretty sure cream of tartar is the answer, as it is a base, and reacts with the baking soda when you add water to a mixture of the two. a base? Is that why it’s other name is tartaric acid? oops, no that’s what it is in solution when it’s ions part, because cream of is the salt, potassium bitartrate…. hey I only got a B+ in chemistry. For clarity: cream of tartar is acidic when dissolved in water. It can be combined with baking soda as a substitute for baking powder. All the search engines need a multi-petabyte bitchslap to make them stop ripping apart quoted strings and ignoring various words the user enters. Try searching for information on the Samsung Galaxy J7 Prime phone. You’ll get a ton of “hits” for the J7. They ignore the word PRIME. Google and company also love to just randomly substitute numbers. If you’re searching for a model X72-AZ widget, you’ll get “hits” for X(some other digits)-AZ. I’ve seen this all go downhill over the past 20 years. Used to be one could put quotes around stings of characters you wanted an EXACT MATCH for and the search engines would respect that. If they didn’t find an *exact match* they would correctly report “Nothing found.”. Back when Games Workshop was trying to trademark the term “Space Marine” that had been in use for at least 50+ years in Sci-Fi, I found ads in 1970’s issues of Dragon Magazine for an RPG titled Space Marine by a company called Fan-Tac Games (founded at least a decade prior to Games Workshop). It didn’t matter what tricks I tried, Google and Yahoo flat out refused to give me any information on Fan-Tac Games. They insisted I *had* to be looking for Fantasy Games. That was until I posted about that bit of stupidity on a few game forums. Lo and behold, a couple of days later a Google for “Fan-Tac Games” suddenly dug up info on that company instead of being forcibly altered to a search for fantasy games. Somebody at Google must pay attention, at least part of the time. I want an option checkbox to disable all their too often useless “help” so it’ll search the web like it’s 1996. Yup, bring back the advanced search operators, the search within results option and… DON’T TELL ME WHAT I FREAKING MEAN. So you never search for something you don’t remember the exact name for? Or never misspell things? Search suggestions and trying to correct seaches is fine as long as it’s done in a good way. And there’s the problem today: Google prefers strongly “massaged” (“corrected”) search results before a search for the exact text. The twice a year that that happens to me in a meaningful way and google actually helps is no compensation for the daily 50 times a day frustration of screwing up my input. +1 In the search for usability for the average common denominator they have made things far more difficult for those who know what they are looking for. Silently substituting model numbers makes it impossible to find what I am looking for and I sure as hell won’t be buying a part for Product XY32A when I am actually looking for the totally different Product XZ16A. The same is happening to error messages. “Our focus group says that the average user is frightened of scary error messages and like the nice friendly Something has gone wrong.” and end up removing the debug information which allows the issue to be easily fixed. Perhaps one of us could make a search engine that does not mangle user input as a prize entry for the next year’s Hackaday prize. A search engine by technical people for technical people. Sounds like you’re advocating for an open-source search engine. That would be really good. If it was combined with peer-to-peer shared processing of each entry, you could reduce the amount of servers necessary and increase search depth by a considerable degree. You’re wrong, even though a search match was better back then, they know better then you do about what you’re looking for. Don’t ever question the All Mighty Google again. Praise the almighty omnipotent Google. “Google ‘Joan Feynman’ and you can feel the search behemoth consider asking for clarification” – Not at all. Her Wikipedia page is on the top, and not until the second page there’s one mention of Richard. Yes, just checked, I’m getting pretty good results, 3rd from bottom it says Sister of Richard, but is all about her. On DuckDuckGo, you get her Wiki page first, and this very HaD article second! But a little literary flair every now and then to make a better story won’t hurt us. Some years ago there was a certain retrospective exhibit at the Seattle Art Museum. I was downtown one day and happened to look up as a city bus with a riotously colored graphics wrap passed. In huge letters that barely fit on the bus it said “FRIDA KAHLO” ! then, almost as an afterthought, in a font maybe 20cm high “Diego Rivera and Mexican impressionism”. I stood on the street corner and actually cried. “For three years, Joan did nothing but cook, care for the boys, and clean the family’s five-bedroom house. The only semblance of science in her life involved baked goods. Joan was miserable.” I hope the kids turned out ok….